No Longer in Love with the Happy Hut? 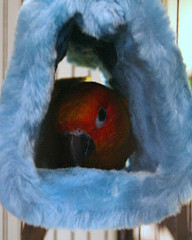 My conure LOVES his Happy Hut….Review of bird sleep tent commonly known as a parrot happy hut and the cozy corner snuggle buddy. Links to cheap places to buy a happy hut for your conure or parrot.